The work presented in this chapter deals with problems of invention where solutions of optimization methods do not meet the objectives of problems to solve. The problems previously defined exploit, for their resolution, a problem extending the model of classical TRIZ in a canonical form called “generalized system of contradictions.” This research draws up a resolution process based on the simulation-optimization-invention loop using both solving methods of optimization and invention. More precisely, it models the extraction of generalized contractions from simulation data as combinatorial optimization problems and offers algorithms that provide all the solutions to these problems. In addition, it provides heuristics to select variables and their relevant values involved in generalized contradictions and/or useful for optimization. The contributions concern theory and practice of the inventive design. 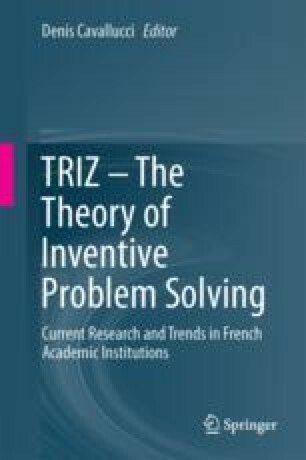 The work also explores cross-fertilization between optimization and TRIZ.